KVUE — Most movies, even short films, take months to create, but Keller Davis and his crew plan to do it in just 48 hours. "It's really intimidating," said Davis. 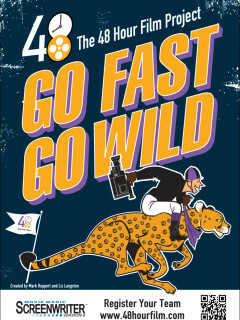 The weekend of August 16-18, the annual 48 Hour Film Project was held in Austin. "They know nothing about what they're going to be doing until the beginning of the 48 hours," said Alyne Harding, who produces the Austin version of the 48 Hour Film Project, an international competition that takes place in 126 cities from March to August. "They have until Sunday night to produce a four to seven minute video. And they have to write it, film it, score it and edit it in 48 hours," Harding said. Participant Lee Bacak on what is needed to survive the 48-hour Film Fest: "A lot of coffee. Lots of coffee and breakfast tacos." On Friday night, she gave 40 teams their assignment. "They give you a couple of elements like a line of dialogue, a prop, a character role and you basically have to craft a script using those elements," said Davis. Each team gets the same elements, with just one difference. "Everyone has a different genre," Davis said, "Everyone draws a genre out of a hat." Davis' team drew suspense and decided to create "Meat the Parents." "We have a young woman taking her boyfriend home to meet her father for the first time and discovers that the whole family are actually cannibals," Davis said. Davis has entered the competition before, and in 2011, his team's film made it to the top 10. But this is the first year the team's editor, Lee Bacak, has entered the competition. "Staying awake for two days now, it's been fun," Bacak said, laughing. He's learning what necessities the team needs to survive. "A lot of coffee. Lots of coffee. And breakfast tacos," said Bacak.